If you are a parent, you have undoubtedly seen first-hand the way a game can engage the mind, body and spirit of your child. Some may even call it “total immersion.” That is why we have been championing games-based learning for quite some time. Take a game and infuse it with the ability to learn something, and a new world of education is born. And for Retalis, whose nephew has autism and was limited in his learning options, finding ways to help children with special needs through interactive learning technologies was not only fascinating, but also very personal. So, along with co-founder Michael Boloudakis, Kinems was born. 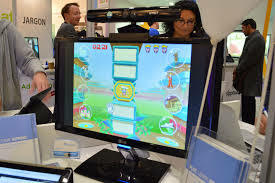 By using Kinect technology, Kinems games are designed to adjust to the needs of each child, creating completely personalized games-based learning. Retalis and Boloudakis work with educators and therapists in order to mimic exercises the children already have to do as part of their education or therapy. When these therapies are integrated into computer-based gaming activities, the exercises increase children’s attention, motivation and enjoyment during therapy sessions, which in turn will speed up the rate they acquire necessary skills. Kinems has rolled out six modularized games, with a new one being added this summer. They are currently working with multiple schools, therapeutic organizations, and just signed an agreement with Regis University to run a pilot program. They were recently featured in Wired UK, and are thrilled with their early success. “Children love the games so much that they’ve been asking their parents if they can play them at home, so we’ve created a free version for home-schooling, but still with teacher-supervision,” added Retalis. I hope you enjoy today’s Daily Edventure with Symeon Retalis! Kinems Founders from Kinems Learning Games on Vimeo. My PhD supervisor, professor Manolis Skordalakis, inspired me the most in how to do applied research in the field of educational technologies. He said that children are not guinea pigs, and we should be very careful when performing research studies in school environments. He was always asking the question: if a specific technology is the solution, what is the real educational problem? He insisted on looking for the educational problem, the learners’ or teachers’ needs that need to be tackled. How have your professional achievements advanced innovation in education? What has changed as a result of your work? Despite some great achievements in the past with some innovative ideas such as Educomics.org or CADMOS learning design, my recent work is most important. I work with Kinems developing Kinect games for children with learning disabilities. We try to offer engaging and effective learning experiences for children with autism, dyspraxia or ADHD via personalized Kinect games. Kinems‘ solution has been effectively applied to authentic school and therapeutic environments with great success. We have seen children significantly improving skills such as fluid intelligence, concentration and hand-eye coordination as an effect of training sessions with Kinems. Recent studies in a special school and a children’s hospital have been published to international journals and conferences. Educational technologies offer new affordances. Learners and teacher can do things easier, faster, safer and in a more engaging way than without educational technologies. Also, these technologies with the appropriate scenarios and content can help children acquire the 21st century skills in a more stimulating way. Collaboration among students to perform group activities without time and geographical constraints, as well as access to learning content. Also, teachers can now feel like members of a larger community of like-minded people who try for the best in education. Definitely. Children need to cultivate 21st century skills in order to be better problem solvers and active members of society, thus trying collaboratively to find the best solutions to today’s socio-economic problems. Educational games. Via playful learning, children can acquire knowledge, skills and attitudes in a stimulating environment. There is an ongoing effort to create open access learning resources for students. Teachers should be trained in order to become educational leaders. Also, the ministry of education should give extra credits and incentives to innovative teachers who are changing the educational era. Moreover, the government should promote the concept of innovative schools, promote the creation of clusters of innovative schools, and not just innovative teachers alone. Finally, the schools in collaboration with the ministry of education and regional authorities should promote the best practices in schools. Favorite childhood memory: Family holidays in Nafplio, Greece. When was the last time you laughed? Why? This morning! My baby daughter made me laugh with her smiling attitude. What is the best advice you have ever received? Be optimistic and do not stay on bad things: Life has ups and downs. This entry was posted in 21st century skills, Beyond the Classroom, External Videos, Game Based Learning, Information, People, Personalized Learning, Researcher. Bookmark the permalink.